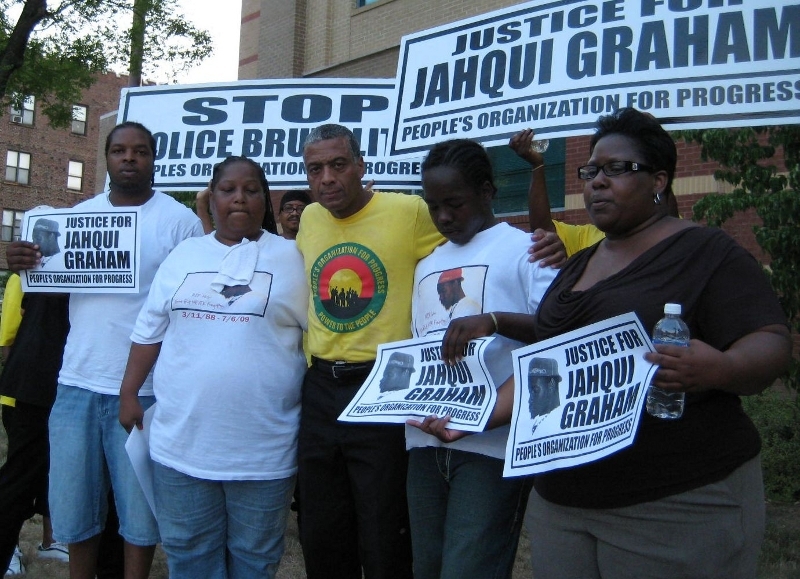 East Orange, NJ community demands “Justice for Jacqui Graham” on the first anniversary of his killing by police | Fight Back! 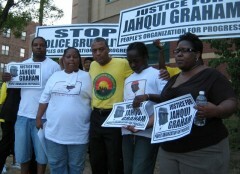 East Orange, NJ - On July 6, 2009 Jacqui Graham, 21, was found dead in a cell in the police headquarters here. His body was naked and badly bruised. He had been arrested for public intoxication a few days before. It is evident he was beaten to death while in police custody. The victim was African-American. A protest in front of the headquarters was held this July 6, the first anniversary of his death. The family of the victim called the protest, which was supported by friends of the victim, the People’s Organization for Progress and the New Black Panther Party. Demonstrators braved heat of more than 100 degrees to demand justice. Hamm continured, “In Detroit police threw an incendiary device into an apartment where Ayanna Jones, a little 7-year-old girl lived, set her on fire. Then they fired into the apartment indiscriminately and shot her to death. This didn’t happen 50 years ago in Alabama or Mississippi, it happened a few weeks ago in Detroit, Michigan. Right here Jacqui Graham never made it to the courtroom alive. He was never charged, never arraigned. He said the only way people can get justice is to demand it. In Oakland in 2009 Oscar Grant was killed by transit cop Johannes Mehserle, who shot him in the back while he was handcuffed and lying on the ground. A transit train was nearby and people took cell phone videos of the killing. Mesehrle is on trial only because people demanded it. He said that in Chicago a former police captain has been found guilty of conspiracy. People were tortured and beaten into false confessions and went to prison for long terms. Finally the victims got together and brought a class action suit. “We are determined to get justice for all victims,” he said. “As the police tell it, Jacqui Graham killed himself. Earl Faison killed himself. It was Amadou Diallo’s own fault he was shot 41 times. The media slant the stories. They tell you someone was a ‘former felon’ to make you think the police were justified. There is a long line of cases right here in East Orange,” he said, citing many. He charged that the country is headed for a police state. “They can charge you with being a terrorist and disappear you, keep you indefinitely, put you in front of a military court,” he said. He concluded with a call for heightened people’s action to stop police brutality.